PC 2000 was a business I ran which was focused on importing computer parts from Asia. We built and resell highly afordable PC computers. 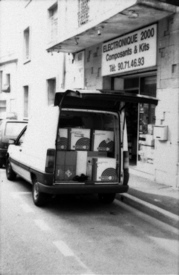 The company was firtly based in Avignon--France-- then moved to Cavaillon. I started up to extend the brand throughout a distributors network. If the early days was really financially efficient, the gross margin dropped significantly with the arrival of asian resellers in France. Therefore I stopped the business and moved forward. Nov. 6th, 1991 10:19 by Stéphane de Luca — Permalink | TrackBack: https://stephanedeluca.com/trackback/262 — updated on Nov. 18th, 2018 04:12 exists for 27 years & 5 months ago - Photos : Copyright © 1991 by Stéphane de Luca. This was the preparation of a networked installation. By the time it was 486 Intel processor-based PC computers, running Windows 3.1 with a Novel Netware 386 Server.